By: waterfall December 13 2017. Large indoor partition screen divider fountains. This beautiful water wall made with white powder coated trim and clear tempered glass with textured borders is sure to amaze. Water flows out over the top of the fountain and over both sides of the wall. These fountains span almost 12 feet in length and stand slightly over 6.5 feet Tall. 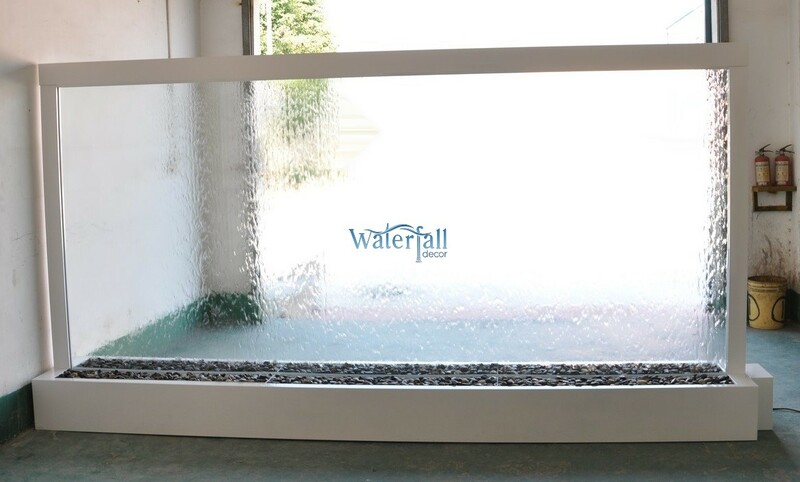 These fountains are suitable for lobby areas, restaurants, banquet halls, large offices, hotels, dealerships, or corporate headquarters just to name a few examples. Place them by the entryway, waiting areas, or in the showroom. While they are recommended for indoor use, they can also be used outdoors under covered areas. All orders come with a bottle of special glass cleaner and cleaning kit. Your choice of black, white, grey, or beige polished river rock in base (reversible rock trays). Comes with 6 LED bars in blue or white along with submersible pumps and micron filter. Our fountains come with a 1 year manufacturers warranty. These fountains are shipped by freight and also available for local pickup from our warehouse.